This radio was a hit in the 1950s and it could become one again, but only to a limited audience. This updated version of one of the first portable transistor radios retains all the 'traditional' features of the original despite this new digital incarnation. Not that you would know from looking at it. A huge tuning dial sits above a mono speaker afront the TR82's cream fascia while a chunky handle hangs over awkward looking waveband buttons. Only a tiny LCD screen and similarly small preset buttons nod to the TR82's digital disguise. Obviously a DAB module replaces the analogue innards of old, but the TR82 still has access to MW, LW and FM wavebands. To our mind it's the only DAB radio that goes beyond FM. It is bound to attract those who are attracted by digital radio, but want the reassurance of access to all the established analogue stations. Connectivity is limited to just headphones and a line out and this simple approach continues in the TR82's operation. Autotune is sluggish but effective, although choosing between DAB stations is a pain: separate buttons are used as well as another for selecting. The process is far from logical, let alone intuitive. Luckily there's an old-fashioned dial to allow fiddling with MW, LW and FM frequencies. A tad on the large side, this DAB radio should at least churn out some decent tunes. Alas, with just a mono speaker behind all that plastic, the sound is flat for music, although a dedicated dial for tone helps voice radio. As for bass, forget it. 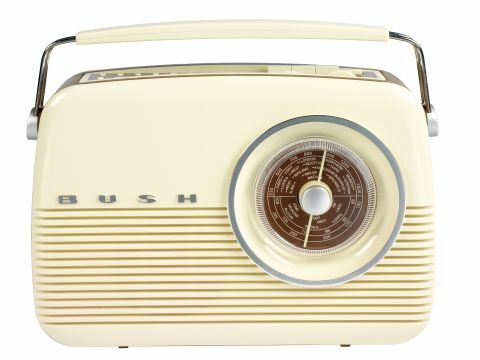 Retro's all the rage in the DAB radio market and none more so than on the TR82, but where other manufacturers churn out blandness Bush has gone straight for iconic design. We love the versatility, but a combination of our reservations about the TR82's ease of use and the poor sound quality keeps it far from the top of our shopping list.